For the next two weeks, Mercury will be well placed in the evening sky about half an hour after sunset. For the next two weeks, we will have our best view of Mercury for 2016. Because Mercury is the closest planet to the sun, it is usually lost in the sun's glare, and thus is rarely seen. It is most easily observed when the geometry of the sun, Earth and Mercury places it high above the horizon. 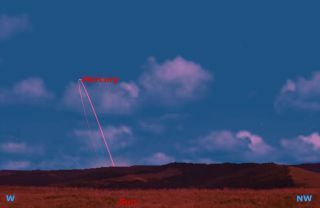 For observers in the Northern Hemisphere, Mercury is at its best in April and May in the evening sky, and October and November in the morning sky. Why a half-hour after sunset? Any earlier, and Mercury will be impossible to spot in the bright twilight sky. Any later, and it will have moved so low that it will be lost in the horizon haze. Timing is crucial for spotting Mercury. You may need binoculars to first spot Mercury, but once you have located it with respect to objects on the horizon, you will find it quite easy to see with the naked eye. It may help to use averted vision — looking slightly away from the exact spot, so that Mercury is placed on the more sensitive part of your eye. If you turn your telescope on Mercury, you'll likely be disappointed. Currently, the planet appears as a tiny half moon only 8 arc seconds in diameter. For comparison, Mars is currently 14 arc seconds in diameter, and Jupiter is 42 arc seconds. The only planets that appear smaller than Mercury are Uranus, at 3 arc seconds, and Neptune, at 2 arc seconds. Astronomers used to think that Mercury was tidally locked to the sun — in other words, always keeping the same face to the sun as the moon does to the Earth. However, this proved to be an illusion caused by Mercury's odd rotation period of 59 days, two-thirds of its 88-day orbital period around the sun. Because Mercury is so close to the sun — 36 million miles (58 million kilometers) on average — and has no significant atmosphere, it is a truly hellish place, with temperatures ranging from 800 degrees Fahrenheit (427 degrees Celsius) during the day to minus 280 degrees F (minus 173 degrees C) at night. Sunrise must be a terrifying event on Mercury. If you manage to spot Mercury during the next two weeks, you will have done better than Johannes Kepler. It is said that Kepler, who was the first person to discover the laws of planetary motion, never managed to observe Mercury even once in his lifetime. Editor's note: If you capture an image of Mercury in the evening sky and would like to share it with Space.com and our news partners for a story or gallery, send images and comments in to managing editor Tariq Malik at spacephotos@space.com.